Glaucoma is the progressive damage to the optic nerve due to pressure in the eye (intraocular pressure) being too high for the optic nerve. The damage to the optic nerve results in progressive loss of field of vision. How quickly this occurs depends on how high the intraocular pressure is - the higher the eye pressure, the greater and quicker the damage. Constriction of the visual field generally occurs gradually, which is why a significant number of glaucoma patients do not even know that they suffer from it. If untreated, tunnel vision occurs. Eventually even the central vision can become lost, causing blindness. 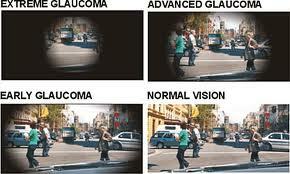 The picture series on the left shows the varying degrees of visual field loss that can occur due to glaucoma. Those with severe visual field contraction in both eyes are not allowed to drive due to the significant hazards posed to pedestrians and other motorists. The main problem with glaucoma is that it is a slowly progressing disease. Sight loss occurs so slowly and gradually that you do not notice it. However, when you do eventually find that you are bumping into things or that you seem to be unaware of vehicles that are approaching from the side, it is too late. Glaucoma damage is irreversible and any vision loss cannot be retrieved. This is why glaucoma is the second commonest cause of blindness worldwide. But there is no reason why it needs to be so. If diagnosed and treated early enough, blindness can be prevented. Early treatment by lowering the intraocular pressure will slow down or even stop the damage and worsening of the sight from occurring. This can be achieved through eye drops, laser and surgery. The key here is monitoring, early diagnosis and effective treatment thereafter. So how is glaucoma diagnosed and monitored? Usually with a combination of clinical examination and tests. There is no one test that provides a conclusive diagnosis, which is why all findings have to be put in context. The key feature is progression. For you to be diagnosed with glaucoma, you must show progression of the disease. And for this to occur, you need to be monitored over a long term basis because progression may take several years to be seen. Intraocular pressure: Your eye pressures should be checked at every visit to your optometrist or ophthalmologist. A high eye pressure will require repeat measurements, ideally during different times on different days, to confirm that the eye pressure is consistently high (and not just a one-off high pressure measurement). However, in low or normal tension glaucoma, damage to the optic nerve occurs despite the eye pressure being within the normal range. If your intraocular pressure exceeds 30 mmHg, you will most likely be started on treatment. Intraocular pressure measurement is ntegral in the diagnosis and monitoring of glaucoma. The most widely accepted and reliable instrument for measuring eye pressure is the Goldmann applanation tonometer (right). Other instruments include the Pascal dynamic contour tonometer, Perkins tonometer, Tonopen and non-contact (air puff) tonometer. Initially, you will need to visit your ophthalmologist frequently, around every 1 to 3 months. This is to ensure that treatment is keeping your eye pressure stable at the right level for you. It is also to make sure that treatment is not causing you any problems. Once your eye pressure stabilises at the appropriate low level, you will be able to go for check-ups less often. Optic disc / nerve head assessment: Damage to the optic nerve occurs at the optic disc or optic nerve head, which is the part of the optic nerve located at the back of your eyeball. To evaluate your optic disc, your ophthalmologist will use the slit lamp microscope and a special lens. Sometimes, to get a better view, your pupils may need to be dilated with eye drops. This dilating effect will blur your vision for 2 to 4 hours, although sometimes it can take longer. It is not safe to drive until the effects have worn off. The diagram on the left shows the location of the optic disc. The picture on the right shows the 2 main components of the optic disc - the cup and the neuroretinal rim. The rim is made of plenty of nerve fibers. The thicker the rim, the healthier the optic disc. In a normal eye with a normal optic disc and optic nerve, the rim is thick and the cup is generally no more than 50% of the size of the disc. In an eye with glaucoma, the disc is excavated with a large cup and thin rims (see image below). Progression occurs when there is noticeable thinning of the neuroretinal rim with time or when there is hemorrhage around the disc. Sometimes your ophthalmologist will take photographs of your optic disc so that comparisons can be made at future visits. Visual field testing / Perimetry: The high eye pressure affects the optic nerve fibres for your peripheral vision first. The aim of visual field testing is to look for any peripheral field loss that may indicate damage to optic nerve. It is also a useful way of monitoring for progression - if your visual field has shown signs of worsening in at least 3 consecutive visits, then it is likely that your glaucoma has progressed. An example of computerized visual field printouts from a normal eye (left) and an eye with glaucoma damage (right). The black color indicates areas that are not seen on testing. In all normal visual fields, there will always be a black oval area which indicates the blind spot. The visual field test involves you facing a big white bowl with a bright or colored spot in the center. You must always keep your gaze on spot in the center. You need to press a special button every time you see a dot of light or movement of various intensities at the different locations. This is done one eye at a time. Some of the tests can take up 10 minutes per eye. Although this can get boring, try to be as concentrated as possible so that the most accurate and reliable test results are obtained. You can test your own visual field at www.testvision.org. All you need is your computer connected to the internet - no other fancy equipment required! Don't get disheartened if you don't think you did well - most people require several attempts before being comfortable with performing the visual field test. The Humphrey-Zeiss visual field analyzer is one of the most popular machines for testing the visual field. Note the device in the right hand - it has the button that needs to be pressed every time a dot of light is seen. Imaging: Recent advances in technology has allowed more detailed imaging and analysis of the optic disc and surrounding retina. These scanning systems are able to acquire 3-dimensional images of the optic nerve and retina and perform topographic optic nerve head analysis and retinal thickness measurements. 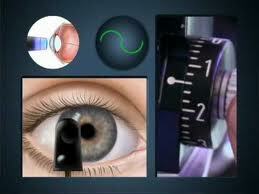 They are reliable, reproducible and accurate in monitoring changes to the optic disc and retinal nerve fiber layer. In contrast to visual field testing, imaging takes only a few seconds to perform. 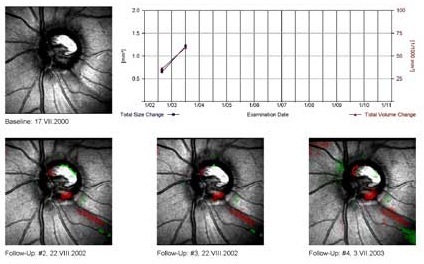 Some imaging techniques are also useful in the diagnosis and monitoring of macular diseases such as age-related macular degeneration (AMD). 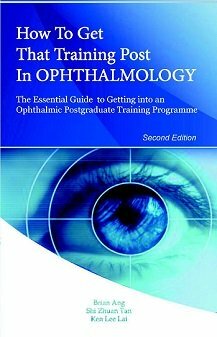 Examples of such imaging methods include confocal scanning laser ophthalmoscopy (CSLO) and optical coherence tomography (OCT). In the scan above, there has been thinning of the neuroretinal rim at the bottom part of the optic disc as highlighted by the red patch. Glaucoma progression has therefore occurred. If your intraocular pressure remains stable and there is no glaucoma progression seen on optic disc assessment, visual field or imaging then you will be able to go for check-ups less often. With time, you may only need to be seen every 6 or 12 months. Although you may not notice any difference in your sight, it is still very important that you attend these appointments to check that your treatment continues to keep everything stable. If your current treatment becomes ineffective and you show signs of progression, then your treatment will need to be changed.